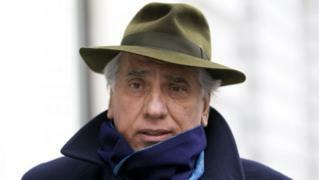 A Mafia boss who faced extradition to serve a jail term in Italy after living for more than 20 years in London has had his sentence dropped. The Italian Embassy said Rancadore's case "expired" last October. Vincenzo Celeste, from the Italian Embassy, said while Rancadore's conviction for Mafia membership remained intact, Italian law states a sentence is considered expired once a period of more than double the time of the penalty has passed. Karen Todner, Rancadore's solicitor, said the Italian Court of Appeal had agreed to extinguish the ongoing case on 31 March. She said she was awaiting confirmation from the Italian Government that the European Arrest Warrant for him would be dropped. Domenico Rancadore's legal team have fought a clever and successful battle but they also had a huge slice of luck. When he was arrested in August 2013, there was just over a year for the authorities to extradite him to Italy. The clock was ticking. Rancadore won the first round by successfully arguing on human rights grounds. The Italians wanted to appeal against that but the Crown Prosecution Service served their appeal papers late. That error ate up more valuable time. Without it, Domenico Rancadore's solicitor, Karen Todner, says her client would have been extradited in time. A British judge finally ordered his extradition in February but by that time the Italian Penal Code's limitation provisions had kicked in and his original seven-year sentence had been extinguished. Ms Todner said: "There has been a long and unhappy history of these proceedings and I am delighted that Mr Rancadore will now be able to live in peace in England with his wife and family." Rancadore, who was known as The Professor, moved to London from his native Sicily in 1993 with his wife and two children, after he was acquitted at the end of a three-year court case over Mafia allegations. However, his name was placed back on Italy's most wanted list in 1994. Five years later he was convicted, in his absence, of being part of a criminal organisation between 1987 and 1995. It was not until August 2013 that he was found living in London and running a travel agency. It prompted authorities to rearrest him, triggering an 18-month battle against extradition. Days later he was assured he would not face an appeal because the Crown Prosecution Service (CPS) had missed a deadline to lodge the paperwork, although it denied it had any "significant bearing" on today's outcome. Rancadore was arrested again in April 2014 after Italian authorities issued a fresh European Arrest Warrant (EAW). In February of this year, Judge Howard Riddle, sitting at Westminster Magistrates' Court, ruled Rancadore could be extradited and his removal from the UK had been expected to take place in the following weeks. Following Wednesday's announcement, the CPS said: "It is inaccurate to suggest that a delay due to administrative errors has had a significant bearing on today's outcome. "Until the EAW was officially withdrawn today, the CPS acted on behalf of the Italian authorities in these extradition proceedings and had received no instructions to the contrary."